James Gordon Brown, Ph.D (born 20 February 1951) is Chancellor of the Exchequer of the United Kingdom and a Scottish Labour Party politician. He was MP for Dunfermline East from 1983 - 2005, then Kirkcaldy and Cowdenbeath from 2005 following a reorganisation of parliamentary constituencies in Scotland. Brown has headed HM Treasury since May 1997, making him the longest continuously serving Chancellor since Nicholas Vansittart (1812-1823). He is widely regarded as being set to assume the leadership of the Labour party after the retirement of Tony Blair. As we face the global challenges of the 21st century, it is important for Britain to rethink its assumptions about society as a whole. As I travel around the country I feel a sense of pride that New Labour's acheivements are delivering real change, but I also know Britain can't be complacent in the modern world. It's right and proper in a modern, civilised multicultural society that no one is left behind and all are on an equal footing. Equally, with the rising threat of China as a global economic power it is also right and proper that we realign ourselves to meet the challenges ahead. Pending my smooth transition, I am laying out my 15 year plan for change which among other ideas, will include new legislation to ensure Britain's competitiveness in the 21st century. It is essential that a competitive responsible United Kingdom rallies behind the beacon of government, and, building on the legacy of Tony Blair, government and business must further amalgamate to provide a flexible and prosperous system for all. Within this review, unprecedented in a generation, we are considering propsoals for a new offence of 'The Glorification of the Middle Class' to ensure all are sufficiently given the opportunities they deserve in the 21st century. It is vital that Britain reform to meet the global challenges ahead for a better world. In 2005, Brown was listed in Time Magazine's annual list of the 100 most influential people in the world. Tony Blair was not included. This could be attributed to the widespread expectation that Brown has no serious rivals for the position as the next Prime Minister. These proposals, and recent appearances, are widely interpreted as preparations for when Gordon Brown becomes Prime Minister and so make him appear to be of more 'leadership material' - and to replace his Scottish identity with a British one in the public mind. Blair, however, has made no indication that he is preparing to step down before the end of his third term. Brown remains the only candidate spoken of seriously in Westminster. But doubts grow, and the Labour defeat in the Dunfermline and West Fife 2006 by-election, after a campaign largely led by Brown (and covering the constituency in which he lives) casts doubt on the Chancellor's ability to win elections without Blair charming the middle classes. On Sunday, 23rd April 2006, The News of the World claimed that Tony Blair had scrapped his plans to hand over leadership to the Chancellor in early 2007 because he didn't trust Gordon Brown to deliver his radical reforms. Further proof of the PM's intention to stay in Downing Street came with news that the Blairs had rented out their "retirement home" in London's Connaught Square for a further year. After that, security renovations to the house were expected to take at least another 18 months. Two unidentified Senior Cabinet colleagues told the paper that Mr Blair returned from his Easter break determined to battle on. These revelations indicate that Mr Blair could well carry out his original promise to serve a full third term in office, thus remaining in Downing Street for almost three more years. Gordon Brown has become the longest-serving modern day chancellor of the exchequer. How much do you know about the role of the chancellor and the people given the responsibility of holding the nation's purse strings? Try our quiz and find out. Gordon Brown - dour or dashing? Academic in his outlook and with a PhD from Edinburgh University, Mr Brown is nothing if not complicated. 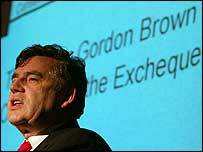 Find out more about the world of Gordon Brown. alcoholic drink while delivering his speech. This is the only time alcohol is allowed in the Chamber. Go behind the scenes with a guide to the Budget. The original Budget briefcase was made for William Gladstone in around 1860. In 1997, the current chancellor, Gordon Brown, ordered a new briefcase. Read more about its history.